Free Shipping Included! Save 1% on the Tripp Lite 6 Outlet Under-Monitor Surge Protector Power Strip, 6ft Cord, Tel/Modem Protection, RJ11, $50,000 INSURANCE (TMC-6) by Tripp Lite at FloType. MPN: TMC-6. Hurry! Limited time offer. Offer valid only while supplies last. 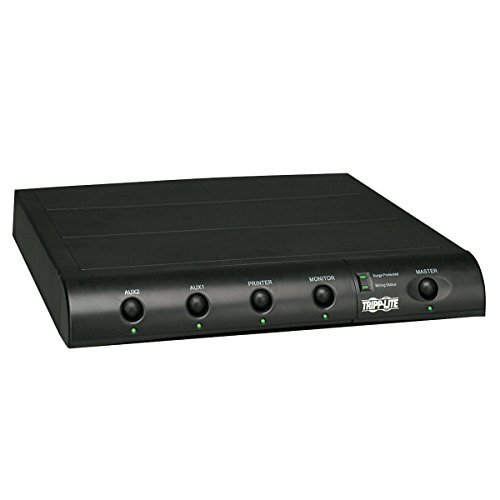 PROTECT ANY PC, DESKTOP COMPUTER & MORE FROM POWER SURGES & SPIKES: Low-profile, under-monitor surge suppressor provides six 5-15R outlets, plus single-line tel/DSL line surge protection. This surge suppressor can protect any computer, modem or home office device from dangerous power surges, spikes & line noise. UNDER MONITOR SURGE PROTECTOR WITH INDIVIDUALLY CONTROLLABLE OUTLET SWITCHES: Features six AC outlets- four of which are individually controllable with their own on/off switches. A master on/off switch controls these outlets plus one additional outlet. The remaining outlet is "always on"-ideal for components such as fax machines that need to remain powered 24/7. "SAFETY FIRST! HIGH JOULE-RATING - TEL/MODEM PROTECTION: 1440 joules means maximum protection for your equipment. Plus, one set of built-in tel/DSL (RJ11) jacks to prevent surges from damaging your computer, fax or modem (one 6-ft. RJ11 phone cord included). LOW PROFILE DESIGN & 6' EXTRA-LONG CORD: Space-saving, low-profile design installs neatly under the monitor, so that power switches are readily accessible and diagnostic LEDs are easily visible. A 6-ft. cord acts like an extension cord to reach any distant wall outlet, while the flat, right-angle 5-15P plug allows furniture to be placed flush against the wall. LIFETIME WARRANTY, $50,000 INSURANCE: Lifetime Limited Warranty and $50,000 Ultimate Lifetime Insurance covers any connected equipment damaged by a power surge.